GTO Filtered Cigars are American made and manufactured by Sunshine Tobacco in Miami, Florida. Produced in three unique blends of Light, Full Flavor and Menthol, GTO filtered cigars offer an abundance of robust flavors and aromas from the first inhale to the last. The mild GTO Gold (Lights) give a sweet, woodsy taste with a mellow creaminess. 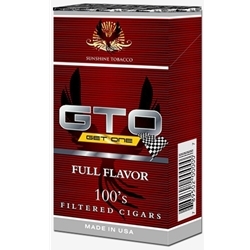 The GTO Full Flavor are contrived with a perfect mixture of premium tobacco blends of spice, vanilla, with a hint of nutty flavor. And for a smoke that gives a fresh minty taste of sweet tobacco, try the GTO filtered menthol little cigars. Our online filtered cigar store offers great deals and inexpensive ways to save money on over-prices retail brands. GTO Filtered Cigars can be the right choice for your smoking needs. Here at Smokers Discounts we’ve made it easy and affordable to buy filtered cigars online. Call us for more details!